The World Scout Jamboree is a key event in the Scouting calendar, which is held every 4 years, each time in a different country. It is attended by Scouts aged 14-18 years old from almost every country on earth. The last World Scout Jamboree was held in Japan in 2015. The theme of the Jamboree was ‘Wa’, which has many meanings including harmony, unity, friendship and peace. 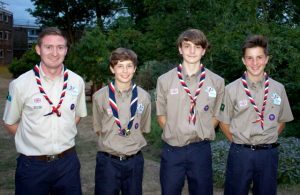 The group are delighted that three young people from group were selected;Connor Townsend, Nicolas Branch and Sam Bartlett. Alan Alexander was also selected to be the Unit Leader for the GLSE contingent to Japan. Below Connor Townsend’s reflects on his Jamboree experience. On the 25th July 2015 I embarked on the journey of a lifetime to the 23rd World Scout Jamboree in Japan, and in a word it was amazing. The experience began with a selection camp and then 10 other preparation camps to prepare us for the surrealism of Japan. When there we began with Home Hospitality, which is a programme in which two explorers spent a few days in a traditional Japanese family and learn about its customs. It was an amazing experience to learn about traditional Japanese customs and how they live their life. Then we went to the Jamboree, which lived up to its reputation. Everyone from all other the world was joined together in a spirit of unity and was extremely friendly and during the jamboree process I managed to make a lot of friends that I still keep in touch with today. Each unit was given a timetable of activities on offer to the Explorers both on and off the Jamboree site, including canoeing, a science lab, rock wall and a trip to Hiroshima; these are just a few of the vast variety of activities on offer whilst at the Jamboree. 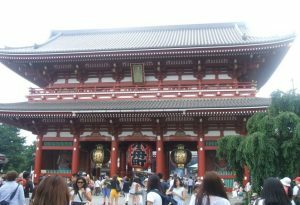 Then came Tokyo, this was a chance to experience Japan as a regular tourist, whilst the Jamboree and Home Hospitality was more aimed towards culture. I enjoyed the fact that we had a chance to go the capital city and go shopping like a regular tourist would, meaning we were able to get the full experience of a holiday including culture and tourism. After much shopping and enjoyment we headed home on and eleven hour flight back to the UK. I thoroughly enjoyed the World Scout Jamboree and if I had the opportunity I would definitely go again. It is a chance to meet people from all over the world and take part in things you never thought you could. It pushes your boundaries as an explorer and is an amazing experience. If you have the opportunity to attend a World Scout Jamboree I would highly recommend you take it as it is a tremendous experience and one that you do not want to miss.